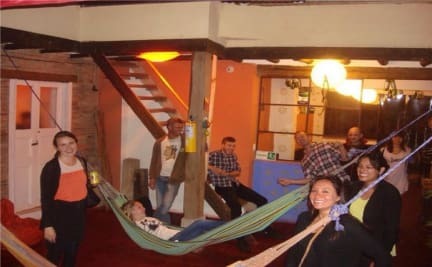 Das Hostel Bakano Backpackers liegt in der historischen Umgebung von La Candelaria in der Innenstadt. Damit stellt es einen ausgezeichneten Ausgangspunkt dar, um die besten Orte der Stadt kennenzulernen. Das historische Viertel ist die beste Wahl! Das brandneue Hostel bietet folgende Einrichtungen: großer Patio, Terrasse, Fernsehzimmer, Kamin, Küche, Waschküche, Schließfächer, Gemeinschaftscomputer, WLAN, voll ausgestattete Badezimmer für Männer und Frauen getrennt, warme Duschen (6), Frühstück inbegriffen, Gepäckaufbewahrung. Schöne Gemeinschaftsbereiche, gut gelegen, sauber und sicher! Sie werden sich wohlfühlen! I searched for a good and quiet hostel and found it in Bakano. The beds were very good and the safety too. It was quiet and very relaxed. Luis, the owner, was very friendly and helpful! He helped me out with my route through colombia and took me to Villa de Leyva. What a service! Leidy helped me too with a lot of tips around bogotá. Couldnt have been better! A big thanks to both of you! They really cared about their guests. This hostel is absouletly recommended! Der Hostel-Papa Luis hat sich sehr viel Mühe gegeben bei der Reiseplanung zu helfen. Die Angestellten waren sehr nett und zuvorkommend. Definitiv zu empfehlen wenn ein Aufenthalt in Bogotá geplant ist!!! Das Hostel ist in Zentrum, sauber, sicher, mit sehr lieben Mitarbeiter. Ich möchte Luis, Lady, Gloria und Yurubie nochmals danken für die gute Zeit in Bogotà. Definetely recommend. The location is really close to everything you want to see in La Candelaria! The rooms and breakfast are basic, but you can buy your own food and prepare it in the morning. The best part is Luis and his staff. They offered to help me plan my whole Colombia Trip and even brought me to the bus station to make sure I know where to go. Luis even offered to teach me Salsa :) The people are already worth it! Many thanks again! Es war unser erstes Hostel direkt nach Ankunft in Kolumbien und im Nachhinein muss ich auch sagen das Schlechteste. Es war ungemütlich und hatte keinen Charm. Das Frühstück war sehr einfach und eine Kommunikation in Englisch war mit dem Team nur sehr schwer möglich. Die Lage ist aber wirklich recht gut. This hostel was ok but not more. Good things were the great location and the friendly staff. What we didn't like was that no one spoke at least a little English. The bathroom/toilet was not clean, there was no hot water for taking a shower (only 15°C outside, so I was freezing all the time) and we were the only ones in the hostel. So the atmosphere was not really nice. Also the breakfast was not too good. No big choice. We wouldn't stay here again. There are better hostels in la Candelaria. Since the rooms are pretty open you have almost everywhere the outside temperature (which is cold). Bathroom is a little bit older and used (shower curtain is duct taped). Not much space in the rooms. But the staff is nice.